Order Today and Save $20! Save $20 with Free Shipping! Estimated delivery time of 7 to 14 days in the USA. The blood profile reveals a person’s state of health. 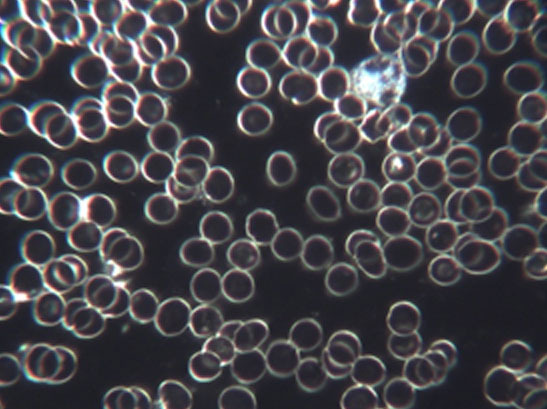 If we look at blood sample slides from a dark field microscope of an unhealthy subject (photo at left), we will see that the red blood cells (RBCs) are sticking together (aggregating) and behaving like glue – with high resistance to flow (“high viscosity”). The photo at right shows the same subject after 25 minutes of using the intranasal light unit. Save $20 with Free Shipping! Estimated delivery time of 7 to 14 days in the USA. non-responsive. For this reason, we provide a 90-day 80% refund. We will also replace the product if there is any defect in the product itself, covered by a 12-month warranty. Intranasal Light Therapy (the simple process of clipping a small red light diode to the nose) is a way to stimulate self healing and boost immunity by illuminating the blood capillaries through the nasal cavity. Numerous conditions have been found to benefit from this therapy as it stimulates restoration of body balance (homeostasis). When in balance, the body can prevent or reverse conditions such as high blood pressure, high LDL cholesterol, diabetes, atherosclerosis, sinusitis, dementia, viral infections, asthma, immune system deficiencies, infections, rheumatoid arthritis, fibromyalgia, psoriasis, certain sleep disorders, and more serious conditions. Researchers have found that intranasal light therapy works systemically, rather than directed at any particular condition. In conjunction with a good health program, it can assist the body in reaching homeostasis, and in the process many conditions are addressed. The light source also stimulates relevant areas of the brain to restore homeostasis and raise improved cognitive performance. Facial areas respond directly to the light source and, as a result, the user may experience immediate relief for pain in the face and neck areas, addressing sinus, nasal congestion, headache, migraine, and fatigue. Treatments are painless, lasting about 25 minutes. Based on the US Food and Drug Administration (FDA) information sheets for medical devices, low-level laser therapy (LLLT), as well as normal light therapy devices, are categorized as “non-significant risk” products. The healing process is completely natural in harnessing the power of the body to heal itself. Light therapy is low cost, effective, and convenient, making it a healing breakthrough. The technology is complementary to medications and dietary supplements in general. More than 40 years of accumulated scientific studies on low-level light therapy reveal no major contraindications, and patients learn to reduce the dosage of other medications (under their doctor’s supervision) as the body heals with regular use of the device. It does no harm, respects the natural power of the body to heal, considers the fundamental health factors, and promotes disease prevention. Most importantly, it gives those who use it ownership of their own health. Intranasal Light Therapy is supported by a large body of scientific evidence, both for the underlying mechanism as well as for demonstrating its efficacy for many diseases. *Note that this statement has not been evaluated by the FDA. This device is not intended to diagnose, treat, cure, or prevent any disease because only a drug (for better or worse) can legally make such a claim. See before and after live blood samples at right using the Intranasal Light Therapy unit. Use daily in the evening (auto-timed for 25 minutes and hands-free) to maintain optimum health and to minimize the occurrence of diseases and ailments. However, users are encouraged to experiment to determine the routine that gives the best result for his/her mind and body. Users should not compensate missed daily treatments by doing more treatments in a day. Use maximum of twice daily (with at least 6 hour break) in the event of a disease or condition that need to be addressed. Built to withstand drop tests and normal use; diode has a specified life of 30,000 hours. The devices have been tested for electrical safety and rendered safe. It consumes and generates less energy than most consumer electronic devices, and the energy cannot be felt by a normal person. They are compliant with the European CE requirements for safety. However, they have NOT been evaluated by any regulatory body, including the FDA and Health Canada. The company does not make any claim for long-term cures although the evidence shows that regular use may improve the user’s quality of life. All evidence have been based on actual available data with these devices and/or published evidence based on other tests based on similar parameters and scientific bases. To see more information go to www.